The Truman Chemistry program recently tied for 20th place nationally for the amount of American Chemical Society (ACS)-certified degrees awarded in the 2008-2009 time frame. Truman’s total of 32 certified degrees exceeds all but one of the Ivy League schools as well as a number of highly regarded liberal arts schools. Truman’s program alone awarded approximately the same number of accredited degrees than the entire rest of the MIAA conference (33) and just two less than the combined total (34) of all four University of Missouri campuses. Since Truman was measured against larger schools, members of the University Chemistry Department conducted a comparison study based on the ratio of the number of certified degrees awarded to the undergraduate enrollment for each of the top 25 schools. When school size was taken into consideration, Truman’s program came in at No. 4 among the ranked schools, trailing only the U.S. Naval Academy, the University of Chicago and the University of Virginia. Novelist, artist, poet and children’s author Benjamín Alire Sáenz will visit Truman Oct. 7-8 for a series of events. Sáenz will present “Juarez Doesn’t Stop at the Border” as a part of the Global Issues Colloquium from 7-9 p.m. Oct. 7 in Baldwin Hall 176. He will talk about his personal experiences living near the U.S.-Mexico border, and will follow the presentation with a book signing. The next day, Sáenz will give a reading and book signing from 1:20-3 p.m. in the Student Union Building 3200 along with Truman professors Joseph Benevento and Monica Barron. The event will be in recognition of Hispanic Heritage Month and Truman’s new Bachelor of Fine Arts in Creative Writing. Sáenz will close his visit with a discussion and reading entitled “Live from the Border” from 7-8 p.m. Oct. 8 in the Student Union Building Alumni Room. Sáenz teaches creative writing at the University of Texas at El Paso. His critically acclaimed first novel, “Carry Me Like Water,” was published in 1995 and awarded a Southwest Book Award. The novel was re-issued by HarperCollins and was awarded a Latino Literary Award for Best Novel in 2006. The Truman Forensics Team recently enjoyed a successful season opener, earning several final round finishes while qualifying for the national tournament. The team traveled the weekend of Sept. 24 to Bowling Green, Ky., for the Western Kentucky University Forensics Fiesta, taking part in two individual events tournaments and one debate tournament over two days. At their first collegiate competition, as well as the first tournament of the weekend, freshmen AJ Taula and Arielle Long-Seabra took fifth place in Varsity Duo. Junior Andrew Grojean took sixth place in Varsity Impromptu and sophomore Jessica Petrie was awarded the championship trophy in Varsity Impromptu. Truman’s team also did well at the second individual events tournament. Petrie took fourth place in Varsity Impromptu and Taula took fourth place in Varsity Dramatic Interpretation. The debate squad also broke three competitors to elimination rounds. Freshman John Carney advanced to quarterfinals in Varsity Lincoln-Douglas Debate where he met his teammate. In this situation, rather than competing against each other, the higher seed advances. Freshman Myra Milam advanced to teammate, senior Dylan Clark, in the varsity semi-final round. Milam advanced again to the final round, taking second place overall at the tournament. Clark and Milam also earned fourth and second places respectively in the individual speaker category. The individual accomplishments of each team member also contributed to team awards, including a fifth place overall award in debate. The individual events team earned third place for the second half of the tournament. These results culminated in the team taking a second place combined award for the entire weekend. For more information about forensics or to express interest in competiting, contact Kristi Scholten, director of forensics, at kscholten@truman.edu. Fourteen McNair Scholars traveled to Kansas City, Mo., Sept. 24-26 to attend the 14th Annual Missouri-Kansas-Nebraska (MKN) Heartland Research Conference. Nine scholars were afforded the opportunity to present the results of their research conducted during the summer. The Heartland Conference program included individual student research presentations, a graduate school recruitment fair and speakers who provided information about application to and strategies for success in graduate school. In addition, the scholars toured the nearby Nelson-Atkins Museum of Art. Detours Magazine is accepting entries for its biannual photo competition. The contest, themed “The Forgotten,” is free and open to all amateur photographers. Entries must include the location of the photo, the photographer’s name and contact information and a short caption. Photos, along with the necessary information, may be submitted by e-mail to photo@detoursmagazine.com or mailed to Detours Magazine, 100 E. Normal, Kirksville, MO 63501. All entries must be received by Oct. 15. The winner will be selected and notified in October and the photo will be featured in the Winter 2010 issue of Detours Magazine. Detours is a travel magazine produced by Truman students. It focuses on the tri-state area of Missouri, Iowa and Illinois, publishing twice annually. In March, Detours received the Apple Award for best general interest magazine by the College Media Advisers. For more information and to see past photo contest winners, visit http://detoursmagazine.com. 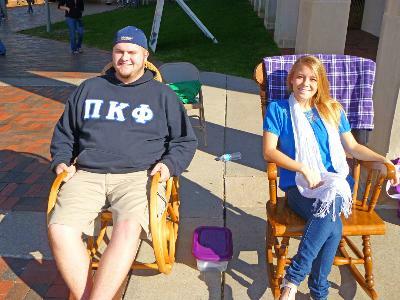 During the week of Sept. 27, members of the sorority Sigma Sigma Sigma rocked in rocking chairs 24 hours a day for a week straight in order to raise money for the Robbie Page Memorial, which gives grants to programs for children’s play therapy. A different fraternity paired with the girls for one-hour shifts, which took place by the fountain on the mall. Senior Kristen Sparks, with the help of Ben Moehle of Sigma Phi Epsilon, raised the top amount at a single shift with approximately $75. As of Oct. 4, the total amount raised for the week was $1033.39. Pictured from left to right are senior Zach Brune of Pi Kappa Phi and sophomore Shannon Colligan of Sigma Sigma Sigma. Find out more about Truman’s interdisciplinary cognitive science minor in an informal setting. Discover more about what cognitive science is, learn what classes at Truman can count toward the minor, see which of these classes are being taught in the Spring 2011 semester, meet some of the faculty, staff and students involved with the minor, ask questions and eat cookies. Teams of 8-12, including at least two female members, must register online at http://serve.truman.edu by midnight Oct. 20. Oct. 25-30. Money and canned goods raised at the event will benefit the Central Missouri Food Bank. For more information, call 785.7222 or stop by the SERVE Center on the lower level of the Student Union Building. If you are unable to attend the forums, visit http://spac.truman.edu and respond to the questions online. The deadline to sign up to participate in the Truman Homecoming parade is Oct. 11 at 5 p.m. The entry fee is $15 and you may register at http://homecoming.truman.edu. For more information, call the Center for Student Involvement at 785.4222. If you are a car enthusiast and have an interest in paying to participate in this parade James Guffey at jguffey@truman.edu would be interested in talking with you. Applications are now available for Foundation scholarships that have not yet been awarded for 2010-2011. They can be found online at http://secure.truman.edu/isupport-s/ and are due by midnight Nov. 1. To learn more, go to http://truman.edu and click on “Student Life/Money/Foundation Scholarships.” Applications for the majority of Foundation scholarships will be available in February for the 2011-2012 academic year. Truman’s Student-Athlete Advisory Committee is conducting food drives at several upcoming Bulldog home games. Fans are asked to bring a non-perishable food item or a monetary donation to a table at the event, which will qualify them for a drawing to win memorabilia from Bulldog athletic teams. Students are also invited to visit http://mcnair.truman.edu or contact Sarah Hass, program coordinator, for additional information. The deadline to submit McNair applications is Nov. 10. The United States Department of State has announced the scholarship competition for the 2011 Critical Language Scholarship (CLS) Program for overseas intensive summer language institutes in 13 critical need foreign languages. CLS institutes provide fully-funded group-based intensive language instruction and structured cultural enrichment experiences for 7-10 weeks for U.S. citizen undergraduate and graduate students. Interested applicants should review the full eligibility and application information on the CLS Program website at http://clscholarship.org. Arabic, Chinese, Persian, Russian and Japanese institutes have language prerequisites, described at http://clscholarship.org/applicants.htm#prerequisites. While there is no service requirement attached to CLS Program awards, participants are expected to continue their language study beyond the scholarship period, and later apply their critical language skills in their future professional careers. Students in all disciplines are encouraged to apply by the deadline of Nov. 15. To access the online application or for more information about the CLS Program, visit the CLS website at http://www.clscholarship.org or e-mail cls@caorc.org. T-shirts can be purchased in McClain Hall 101 during regular business hours. Featuring guest instructor Frank Young, director of the Arthur Murray Dance Studio in Princeton, N.J. Members of the Truman and Kirksville communities are welcome to attend as many sessions as they choose. All classes are accessible for every level of dancer and build within the set dance style. Stop by the library to check out the displays. Scholarship Experts has announced they have several scholarship opportunities for students. 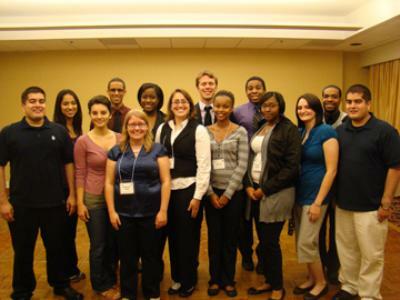 To view the various scholarships, please go to http://www.scholarshipexperts.com. Lloyd Pflueger, professor of philosophy and religion, had his article on the history of the Indian concept of god, “Ishvara,” published in “Brill’s Encyclopedia of Hinduism,” Vol. II. Barry Poyner, professor of communication, and Abigayle Richardson, a communication and political science double major, presented a research paper entitled “Preparing Students for Academic Audiences” Sept. 25 at the Speech and Theatre Association of Missouri Convention at the Lake of the Ozarks. Richardson was also awarded a scholarship from the association for her desire to teach communication on the secondary level. “Design, Fabrication and Test of a Microsatellite” will take place at 4:30 p.m. Oct. 6 in Magruder Hall 1000 as a part of the Physics Colloquium. The event will feature Henry J. Pernicka of the Department of Mechanical and Aerospace Engineering at the Missouri University of Science and Technology. Snacks will be provided five minutes before the talk. Obi Nwakanma, professor of English and linguistics, will present “Aesop, or the Atlantic Sources of Greek Thought,” for the Folklore Colloquium at 5:30 p.m. Oct. 6 in Ophelia Parrish 2113. President Paino and Student Body President Isaac Robinson will be hosting budget town hall meetings at 7 p.m. Oct. 6 and Oct. 12 in the Centennial Hall Main Lounge and the Ryle Hall Main Lounge, respectively. Students will have the opportunity to hear the latest on the University’s budget crisis, give opinions on how to best solve this problem and discuss any other issues. The Student Health Center will be offering walk-in clinics for seasonal flu vaccines from 1-3 p.m. Oct. 7. The vaccine includes protection against the H1N1 virus. The cost is $15 and charges will be billed to the student’s account. No insurance billing will be done and no appointments are required. The Global Issues Colloquium will present “Juarez Doesn’t Stop at the Border” at 7 p.m. Oct. 7 in Baldwin Hall 176. The Environmental Campus Organization will sponsor “No Impact Man” at 7:30 p.m. Oct. 7 in the Student Union Building Georgian Room A. Visit http://noimpactproject.org for more information about the program. Discount 2009 and 2010 Earth Week T-shirts will be available for $5. The Student Activities Board Coffeehouse will feature Plain Pilot and Claire McClain at 7 p.m. Oct. 17 in the Student Union Building HUB. The event will feature free refreshments, including warm beverages and snacks. The Career Center will host Aldi Oct. 27. Sign up for interviews at http://truman.experience.com. E-mail careers@truman.edu for more information. Phi Sigma Pi will host “Dance ‘til You Drop for TFA” from 6:30-11 p.m. Nov. 5 in the Student Union Building HUB. Registration is $10 for teams of 2-4. The event will feature prizes, guest performances and light refreshments. Contact jcr3482@truman.edu for more information or to register. All proceeds will benefit Teach for America. The 21st Annual Undergraduate Philosophy and Religion Conference will take place from 9 a.m-6 p.m. Nov. 6 in the Student Union Building Conference Room.